OK, you upgraded from Windows 7 or one of the Windows 8 flavors and want to personalize your machine. In previous versions of Windows, all the way back to Windows 95, you could create themes, have slideshow backgrounds and change your color scheme. You can still do that, but Microsoft seems to have gone out of its way to make it way more complicated than it should be. This is one thing in Windows 10 they got wrong. This short little guide should help. This is actually easy to do, just buried. So, to start, you will need to create a folder and put the pictures you want to show in the folder. 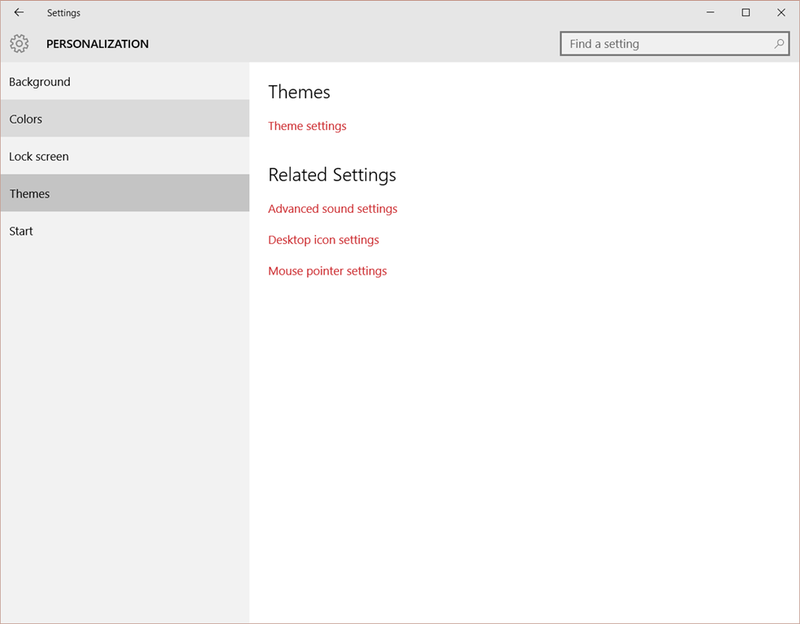 Next, open up the SETTINGS app and select PERSONALIZATION or, right click the desktop and select PERSONALIZE. Next, select BACKGROUND. In the BACKGROUND selection box, click the arrow and select SLIDESHOW. Below that, there will be another button where you can actually choose the folder that contains the photos you wish to include in the slide show. Select the folder, click the Use folder button and that’s that. Your slideshow should start. You can change the duration, shuffle the pictures, etc. Setup your background image, if you want a slide show, follow the instructions above. Now, to setup your sounds, right click the desktop and select PERSONALIZE. From there, select THEMES. There is a link to setup the system sounds, click that and it works and looks EXACTLY like it did in previous versions of Windows. Once done, Click OK to close that window. Repeat the process for the mouse, if you want to change that as well. Once it is all the way you want, click the first link, Theme settings. This takes you to the OLD Theme page, but there are no options on the page. However, the very first Theme listed is the current theme and it is called ‘UNSAVED THEME’ Right click that and select which type of theme you wish to save. The first choice simply saves the settings for YOUR use. The second choice gives the ability to package the theme so you can share it. Make your choice and give it a name. Click OK and your new theme becomes a selection along with any themes you already had. NOTE: in place upgrades will preserve any themes you made in previous versions of Windows. New installs will have a few that come with Windows 10. Also, note that the ‘unsaved theme’ choice is missing now. It will reappear once you make a change. You can change the image that displays when you boot the computer or lock it. Right click the desktop, select PERSONALIZE and then LOCK SCREEN. From here, you can change the image for the lock screen and make it a slide show, static image or a BING picture of the day. Click Background selection button (the down arrow) and make your choice. If you select SlideShow, you do the same thing here that you did for the desktop background slideshow. Once you select the background, you have other things you can set, like the application updates you want to see (for example, calendar events, weather, etc.) Set those by clicking one of the little squares with the plus sign. You will see a list of available apps to use for notices here. Not all apps will show since not all provide this functionality. You can also change the screen saver from here. Scroll down until you see Screen Saver settings. Click the link and you will see the screen saver settings that we all know and love. Select your screen saver and click OK. There are other things you can do to further customize your experience. You can change the color scheme from the PERSONALIZATION page. I have it set to use the primary color of the background image, but you can make it whatever you want. Go on and explore the Personalization page. 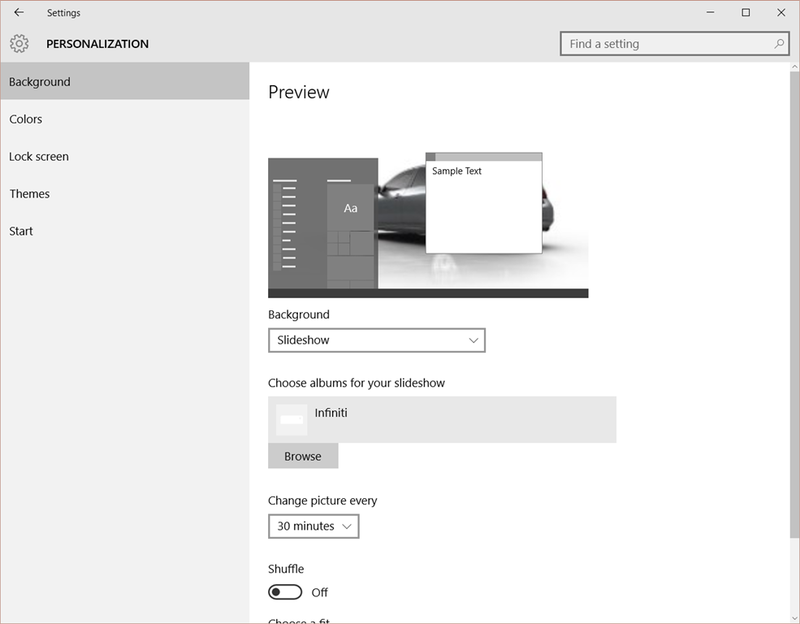 You will find most of the things that were in the previous versions of Windows, just looking a little different now and, unfortunately, often buried where you would not think to look…like the screen saver settings in the LOCK SCREEN page. Any questions? Post them in the comments and I’ll try to answer. With Windows 10 about to launch, I thought I would share some tips on using the ‘new’ operating system. If you have used Windows 8/8.1, some of these will be familiar. One of the things about tabbed browsing is having a tab play audio when you don’t want it or expect it. Finding that tab, especially if you have many open, isn’t always obvious. With Edge, in Windows 10, it is a bit more obvious. Refer to the photo, the opened tab has an audio indicator and a play button. These let you know which tab or tabs have media playing. You can switch to that tab and take care of the offending media. In the current version, 10240, EDGE does not have the ability to display multi levels of forward or backward pages. For example, in IE or Chrome, if you right click the back button, you will see 10 levels or so of history. Not so in EDGE. The Start Menu, which Microsoft decided to bring back from the dead, has been greatly enhanced. It is also customizable. In Desktop mode, the Start menu takes up little space. It has, on the left side, that traditional style Start Menu listing of applications and functionality. On the right side, is what remains of the Windows 8/8.1 Start Page. You can pin things to the Start Page and the live tiles will work, provided the tile belongs to Windows Store application. The whole thing can be resized by grabbing the upper right corner of the menu and dragging it up and to the right. In Desktop mode, you can make the Start Menu take up the entire screen, if you like that. To do so, go to Settings->Personalization->Start. Click ‘Use Full Screen’ and close the settings. Click the Start Button and you should see a full screen Start Menu/Page. Right clicking on a live tile will pop up a menu giving more control over them. You can unpin the tile, resize it, turn it on or off, pin to the taskbar or uninstall the application. You can make the taskbar, action center and start page transparent by opening Settings->Personalization->Colors. Turn on the transparency by clicking ‘Make Start, taskbar, and action center Transparent’ slider. The ALT-Tab task switching, though looking different, still works the same. Microsoft has taken that notion, added in a bit of the Vista style task switching and went full screen with tiled representations of the running applications. You can select an application to switch to OR…and you LInux people will deride this as old, send an application to a new desktop. 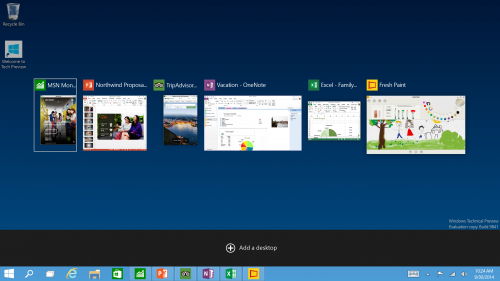 Yes, Windows 10 now has multiple desktops. You can activate this feature by clicking on the desktop icon next to the Cortana icon on the task bar. 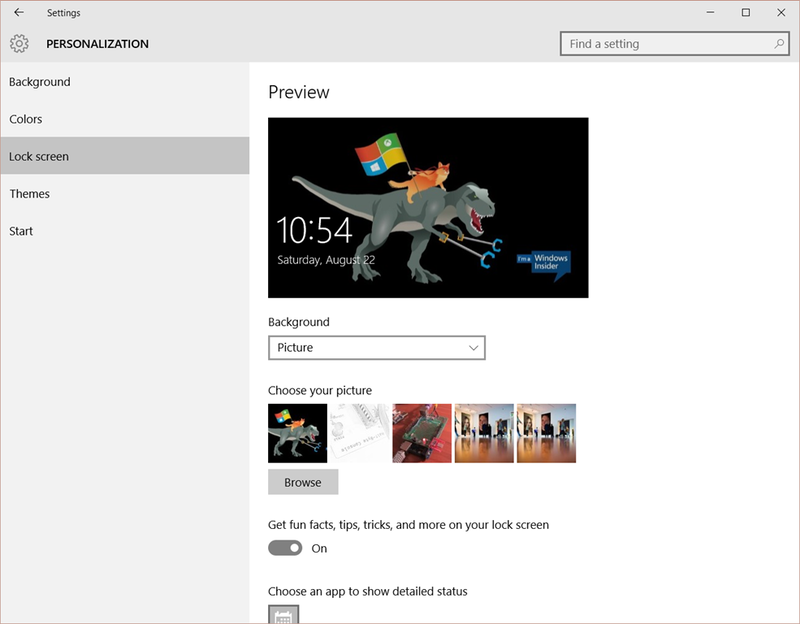 So, there you have a few nice features of Windows 10. Check back for more. As part of his graduation, we gave my oldest son a gaming computer. It’s nothing too fancy, a middle of the road gaming rig so he can play League of Legends with as little ‘lag’ as possible. The machine we got him, a CyberPower PC special from Best Buy, is no slouch: quad core, 3.7ghz processor, AMD/ATI R 6700 graphics, 8GB of RAM and a 2.2TB HDD. Oh, it runs Windows 8.1. Now, the computer came with a lesser graphics card, my son inherited the R 6700 (I think that’s the number) card and, ever since we put it in, it has caused several blue screens. In all of the time I’ve run 8 or 8.1, I think I’ve had two such issues. Well, with the last blue screen, came an activation issue. Windows did not think it was activated. So, I proceed to activate. No go. After several attempts, I discover the key is now invalid. What? A call to Microsoft resulted in finger pointing to CyberPower PC. The key is an OEM key and Microsoft refuses to help on them. So, I call the OEM. As it was on a Saturday, they had limited hours and I had both limited patience and battery on my phone. After 45 minutes on hold, my phone was losing juice and I lost patience. Remembering that I had a clean, legal copy of WIndows 8 PRO-with an unused key-I thought, well, I’ll just install 8, upgrade to 8.1 and put him on the Windows 10 track. Simple. It started out great, Windows 8 took 20 to 30 to install. Upon the desktop setup, I proceed to the Windows Store to grab 8.1. No go. Have to update first. How stupid is this? So, I goto Windows Update. Boy, my friend Sam was right, this damn thing is broken. Sorry Sam. Over 150 updates awaited. So, I told my son to keep an eye on it and my wife and I went out. At some point, it appears the computer went to sleep. DURING UPDATING. My son lets me know. Well, the interrupted update BROKE the update process! Nothing I did fixed it. It’s 11pm now and I’ve wasted the day-save the two hours I was with my wife-on this bloody computer. Not happy. So, I recalled that one can go to Windows 10 directly from 7, 8 or 8.1. So, I went ahead and upgraded to the most current build of Windows 10. The upgraded took about 45 minutes, but it worked like a charm. We had to install Direct 3d/dx 9, but League of Legends worked and did not need to be reinstalled – which, itself, takes hours and hours and hours. So far, with one exception, 10 has worked very well. It did blue screen, but the error was really odd and had to do with sound. This computer has some odd hardware, so I am thinking it is a driver issue and I plan to check them all for compatibility. This whole process was just a joke. Windows Activation is the most assinine thing yet. There is just no reason for Microsoft to continue with that mess. It does not stop those who want to steal it and just causes major headaches for those of who play by the rules. And Windows Update? Holy hell. What a major blemish that has become. Microsoft, I implore you, do the right thing and ditch activation. Fix the update process. And hire people who can CLEARLY speak the same bloody language as those who call your centers. 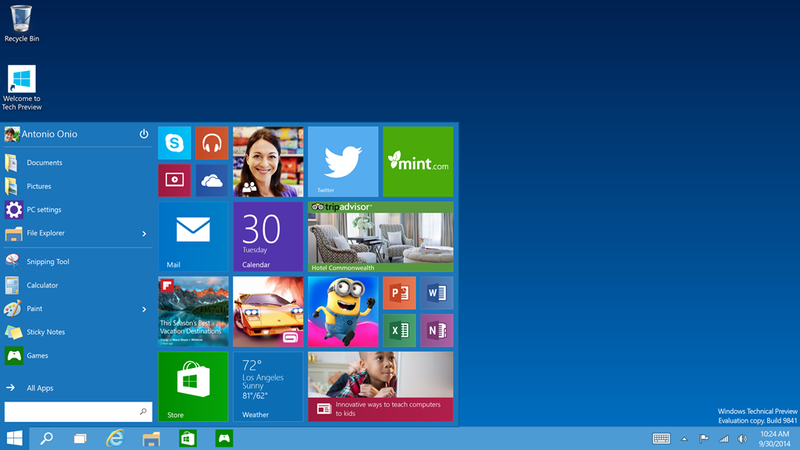 Microsoft, today, introduced Windows 10, the successor to Windows 8.x, Windows Phone 8.x and Windows RT. While today’s presentation was aimed solely at the Enterprise, there were nuggets for everyone else as well, especially those who did not like the current version (and probably did not even bother to try it) and its Start Page and tiles. Indeed, todays presentation showed off changes for the desktop and how Windows will handle the variety of devices. This means figuring out what it is running on and, in the case of tablet/laptop hybrids. 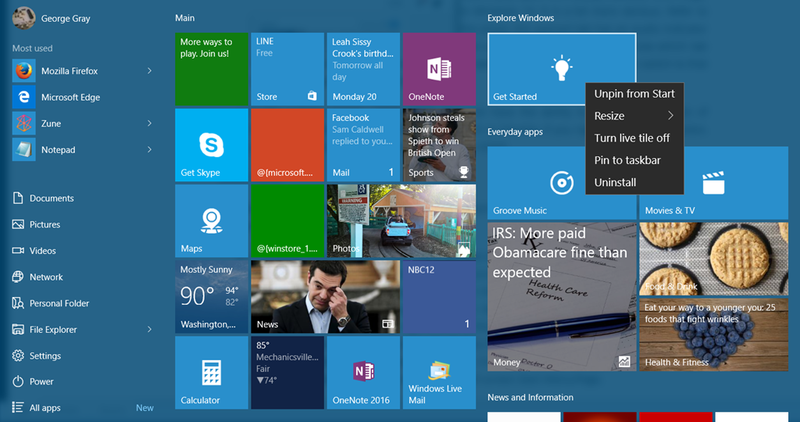 If it detects a touch screen, it will default to the Windows 8 style with the Start Page, touch centricity and tiles. If it detects a mouse and keyboard, it defaults to the desktop and the keyboard/mouse centricity. It is something called Continuum and looks rather nice. 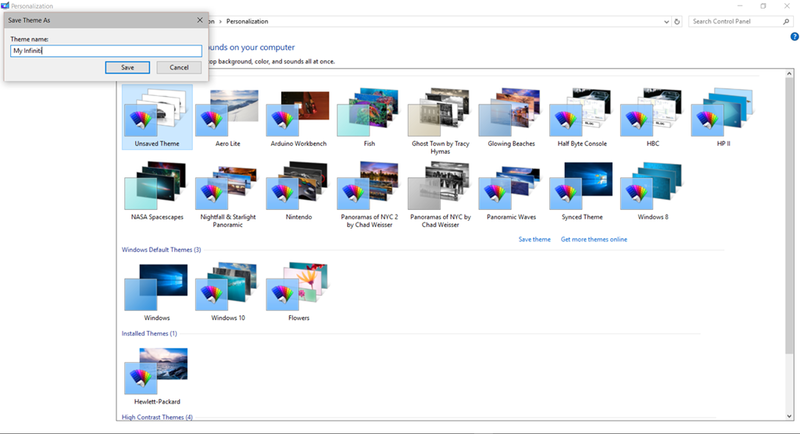 The desktop receives a welcome upgrade in the inclusion of the Start Menu with Tiles. The Charms bar, still in the Technical Preview showed at the presentation, is accessible in much the same way. 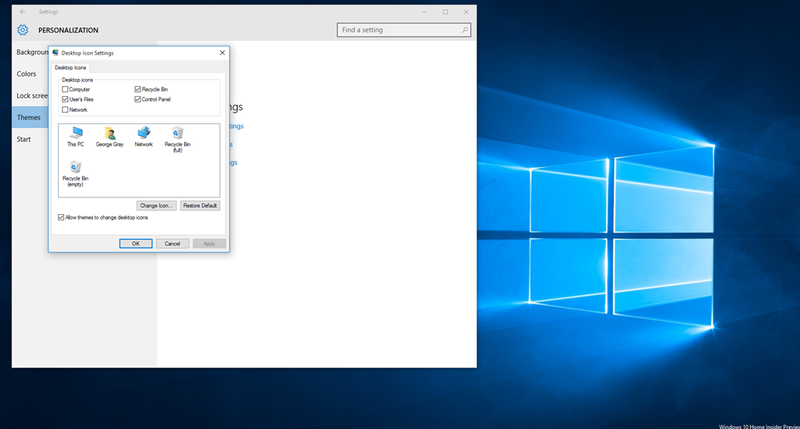 The task manager has a new button on the task bar and the ability to create, manage and use multiple desktops is built in. The feature resembles similar features found in Linux and Mac OS X. Even the Command window got updated: copy and paste now work IN the window, no need to use an inconvenient context menu. 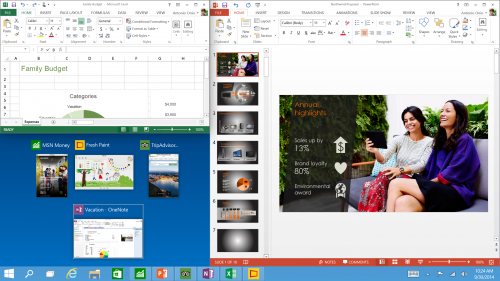 Windows 8 Style apps can now run in windows right on the desktop, which, for some, increases their usefulness. The Start Menu is both old and new and incorporates a pared down Start Page. Part of it is the old style menu, the other half is the pared down start page. A nice compromise. Another interesting thing Microsoft has done is enhance the Windows 7 Snap feature. Previously, you could drag a window to the right side and snap it in place and then drag another to the left and snap it. Now, from the new task list, you snap up to four windows, certainly something a power user or developer will welcome. Terry Myerson and Joe Belfiore stuck around for questions after the presentation. Among the questions asked was what this does to Windows RT and Windows Phone. The answer was that Windows 10 would be available to the majority of devices running Windows. 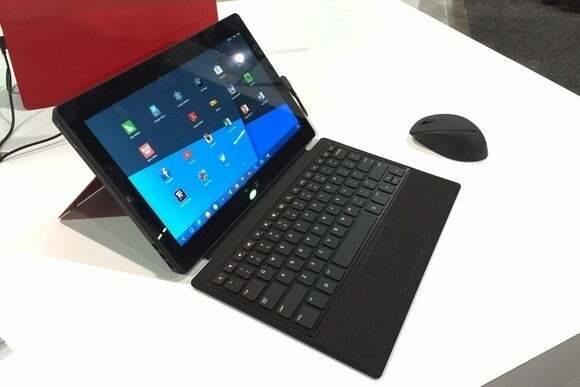 Previously, they had said it would, in fact, run on ARM based devices…which includes Windows RT tablets. Now, recently, it was revealed that the majority of Tablets are, in fact, RT. So, I cannot imagine that this segment will get ignored. Windows Phone will be replaced with Windows 10, something we already knew. All in all, the new version looks promising and you can get your hands on a very early build, starting Wednesday, October 1, 2014. Go to http://preview.windows.com/ to download the ISO file. Touchscreens have been around since the 1960’s, possibly earlier. 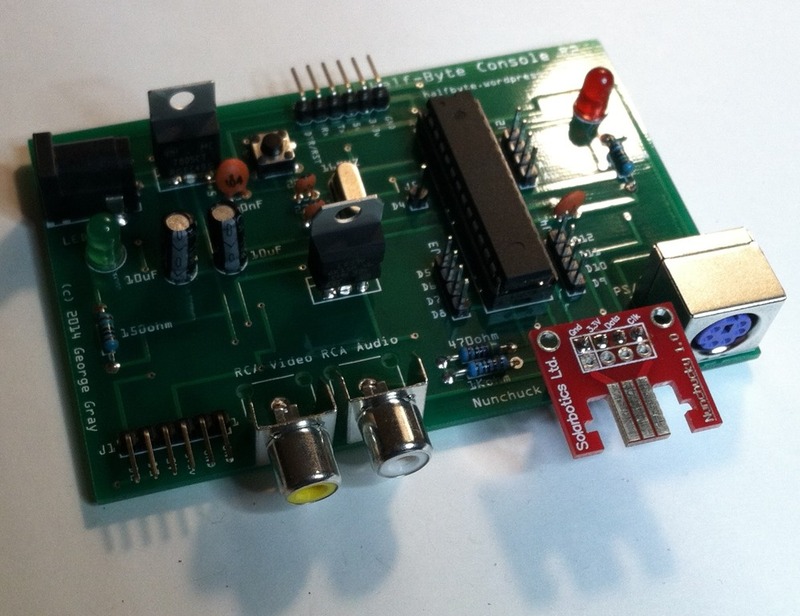 Many schemes have been used, everything from the current overlay technology all the way back to the old light and photocell matrix and everything in between. There are advantages to them all and many, many disadvantages. The current flurry of technology employing touchscreens was sparked by the innovative iPhone from Apple. Steve Jobs despised the tried and true stylus. He famously said that we already have the best stylus: our fingers. Well, not so fast there, Mr. Jobs. On large screen devices, like the full size iPad, my Asus Vivo Tab with Windows 8, and pretty much any device that is 8 inches or larger, your finger may work great. But, not so much on small screens. I have found that it is not really the technology itself, but the user interface that is the real problem. Especially with the bloody on screen keyboard. If a hardware keyboard fan ever needed a reason to bring back an actual keyboard, one needs to look no further that the iPhone. (Hot on its heels: Windows Phone 8). The iPhone’s onscreen keyboard is just awful. I constantly hit wrong keys. Now, some of it is my fault, most however, are not. When it isn’t being responsive, it’s just too damn small. Which is really surprising since the best on screen keyboard I’ve ever used in a small form factor is that on the Zune HD. Both Apple and Microsoft should take a look at that one. Funny, Microsoft designed it and promptly forgot it when doing the Windows Phone 8 OS. Aside from too small or unresponsive, the predictive text is also a problem as is spell check/autocorrect. Now, these should be very useful features and, indeed, can be. BUT…when they screw up, they REALLY screw up. Yes, you can disable them, but, why should you have to? They should just work and they should give you an easy way to maintain and add to the database. If they do, then there’s no easy way to find it. At any rate, why can’t these companies come up with decent on screen keyboards? Ones that work. Ones that are not hard to use and that just work. You should not have to think about HOW to type while typing. User Interfaces are another source of frustration. For example, the antiquated Windows desktop is very difficult to use simply because its widgets are just too small for your fingers and designed to work with a mouse and not your finger. On iOS, they did a much better job with the UI, however, the multifinger gestures do not always work the same. And, sometimes you swipe down, sometimes you swipe left to right to do the same thing. iPhones present a real challenge due to the screens size. I find it difficult to play some games on this device because of the size of the screen. Other apps, like the music player app, can be difficult to use, especially if you have larger fingers. I find myself constantly selecting the wrong thing simply because the icons are too small. In this new world of touch, designers need to take a step back and actually use the stuff they put out, before they put it out.I suspect a number of things would be caught and corrected prior to release. I’m sure such products would dominate.